One of the characteristics of today’s world is our constant quest to improve ourselves and become as happy as possible, in both our private and work lives. At Goodgame, we are also continually working on building a better company and happy team because we are convinced that this is the basis for good games. 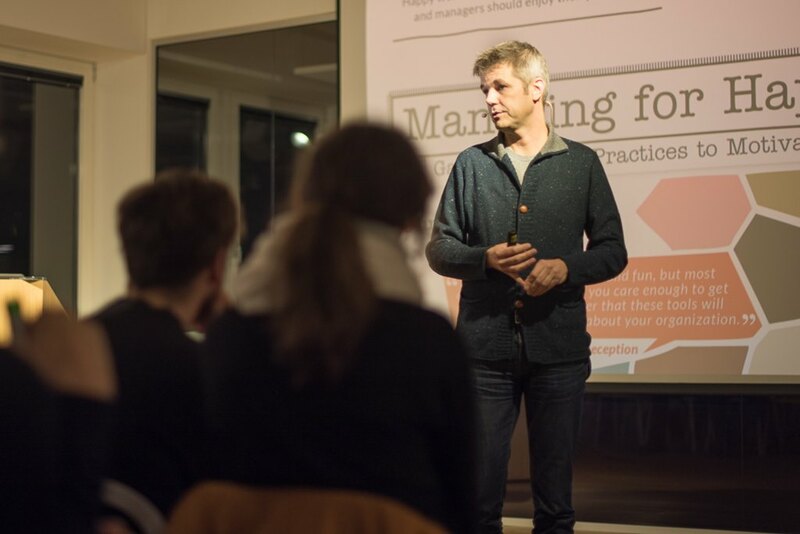 That is also why we strive to improve our people management skills and why we invited Jurgen Appelo, author of the book Managing for Happiness, to our offices this week to give a talk about “games, tools, and practices that motivate any team”. The leadership guru’s mantra is that happy workers are productive workers, and in his inspiring speech, he shared some hands-on management techniques and ideas to foster personal development within teams. 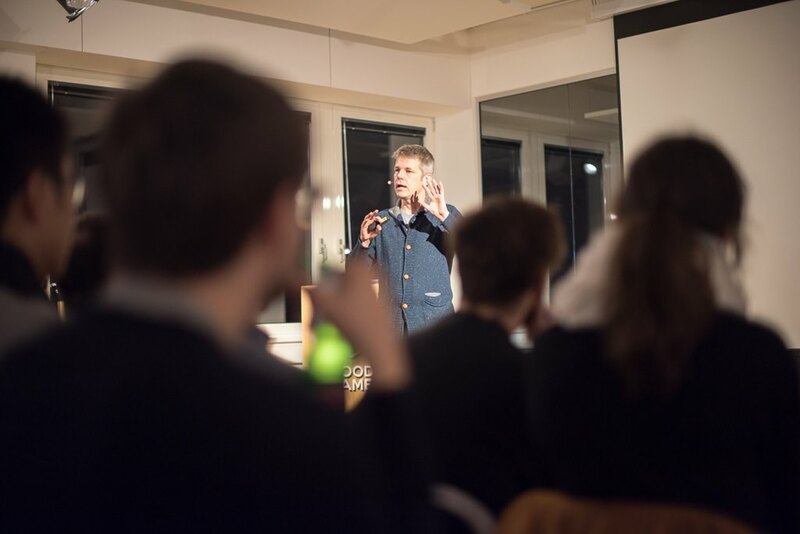 We quickly accepted Jurgen as our coach of the evening thanks to his background as a software engineer and dream to found a gaming company after his studies. Most of his tips on people management spring from his experience as the CIO of a software development company that had also grown very fast – similar to Goodgame Studios. When he asked us if we think that success leads to happiness, or rather that happiness leads to success, about 90 percent of the Goodgamers who were present agreed with the second statement. We were all ears to hear about his secrets. 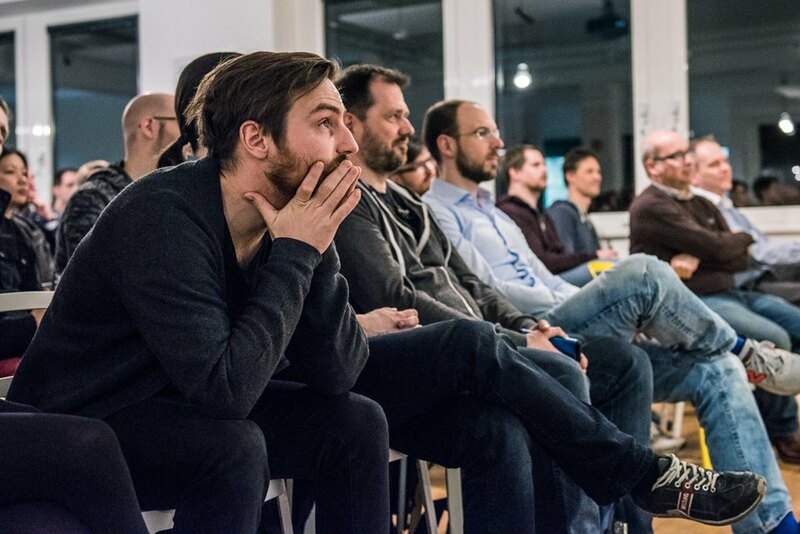 In his earlier days, Jurgen explained, he did not know how to be a manager, but he learned how to do it because he started to run experiments – the first of which were his “360 Dinners”. For these dinners, he created a spreadsheet with the names of all his employees to choose people at random and invite them to share a meal at his house. He would do the shopping and have the recipe on hand, but when his guests came, they would have to do the cooking – much to their surprise, of course. But the experiment went well because he had created an environment where these people were able to organize themselves and do something quite cool and fun together, which ultimately made them happier. This is one example of why Jurgen believes that the secret to becoming better managers and better creative workers is about fun – among other things. To Jurgen, running more of these experiments significantly increases employee engagement and commitment. The reason? Experiments in themselves already make people happier and more motivated because they experience something new. And, of course, they have the potential of leading to bigger success. One of the suggested experiments that Jurgen himself now uses as an established method in his team is personal maps. With this tool, he aims to improve communication and understanding among coworkers. The idea behind it is that a mental (not geographical) closeness is key to a great team, and that this can be achieved by using the concept of mind maps and applying it to people. So whenever a new member joins his team, Jurgen asks them to create a map of themselves. They are then not allowed to present it themselves, but the rest of the team is invited to ask any kind of question. These maps look very different from person to person, but people usually find similarities to their own lives, and thus connections are created within the various team members and collaboration is improved. Another successful experiment is the idea of merit money, i.e. paying people according to their merits. Instead of using a normal bonus system, where employees get a certain amount of extra money by the end of the year that is distributed by the manager, Jurgen has introduced a new system. In his team, every employee gets the same bonus, but under one condition: they cannot keep it to themselves, but need to distribute it to their colleagues as they see fit, which leads to a measurable 360° peer-to-peer performance appraisal. On top of that, it is not specified when the bonus will be paid out, but every month the team rolls a die, and if a six comes up, they will receive the accumulated money. Again, this method keeps it exciting and fun, and it motivates and leads to happier employees. In a nutshell, Jurgen wants us all to keep running experiments and trying new things. He pointed out that anyone can start and you do not need to be a manager to be able to experiment with new ideas. Experimenting is like playing games, he said, so it should come quite easily to us Goodgamers. Let the games begin!